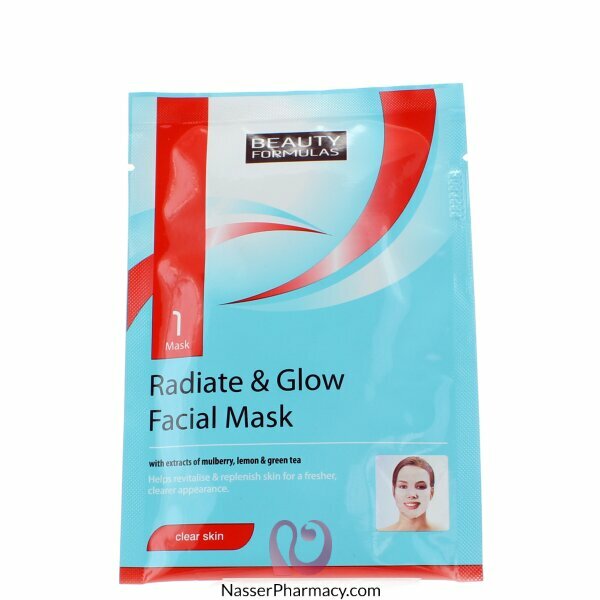 Beauty Formulas Radiate and Glow Brightening Facial Mask is a specially developed pre-moistened mask to regenerate the skin with natural complex ingredients to help restore and replenish brightness and glow to the skin for a more radiant look. It revitalizes and invigorates dull, lifeless skin for fresher, clearer skin and makes skin brighter and more radiant. It comes with Arbutin, Mulberry Root Extract, Orange Fruit Extract and Green Tea Extract to penetrate the skin deeply to enliven and replenish. Clean and dry your face. Unfold the pre-moistened mask and apply to the face and nose area. Leave the mask for 15 minutes to allow the ingredients to fully penetrate the skin, and then gently remove the mask peeling carefully from the edges. Rinse face and dry.